In all my years in EMS and my almost 14 as a paramedic I have seen a lot of creative solutions to the problems that we face on a daily basis. Some have worked and stuck for years. Others? Not so much. There are two all too common issues that I seem to encounter on a week by week (or even shift by shift) basis that have some very logical products on the market that I feel present an excellent solution to an otherwise challenging issue. Also, I feel the need to mention that neither of these companies solicited me to write reviews of their product. These reviews are based on my own personal experience. The EP+R Hand-E Hand Hold Device – One of the biggest challenges of any cardiac arrest or even an unresponsive patient that we are required to move on a backboard present is the conundrum of how to keep their arms secured so that responders can assess them and provide treatment. Some use tape, other try to tuck their hands into their pockets or waist band, or even use a creative tie with a cravat. The best solution that I have found though is EP+R’s Hand-E device. Back in 2006, one of the paramedics that I worked with in Massachusetts decided to solicit a few companies for demo versions of their hand restraint devices. There were straps that needed to be wrapped a certain way, and a few solid devices that aimed at keeping a patient’s arms “in” to prevent them from snagging on door jams or ambulance cabinets. We tried a handful of them and none was as easy to use and effective as the Hand-E. It’s quite simple to use: after attaching the device to a waist strap of a backboard you put a patient’s wrist in each of the openings and secure it with the rubber strap. A patient’s arms remain reasonably flexed to allow the flow of IV fluids to continue while their elbows are kept close enough to the body that moving patients through doorways or taking them out of an ambulance becomes remarkably easier. According to EP+R’s website, the Hand-E retails for around $22. 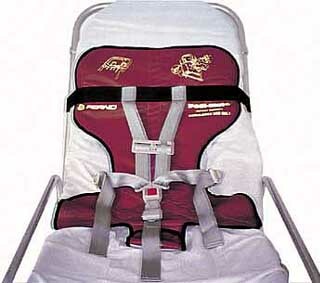 The Ferno Pedi-Mate – Safe transportation of pediatric patients is always a concern in an ambulance. We, of course, never, ever, under any circumstances, transport a child in a parent’s lap. Furthermore, adequate padding and proper strap placement are difficult to achieve when trying to secure a child to a stretcher. From working with AMR and our fleet of 35 van ambulances, we were constantly forced to do more with less, and that included space. Child seats were kept in the supervisor’s truck and shuttled out to crews in the field should they need it. If the supervisor was unavailable, and if the child’s own seat was not on scene, the crew was left with some difficult decisions to make. My thoughts on potential solutions to this problem changed completely when I was in Oakland, California in late 2009. We were on the scene of a child who was “sick” with a mom who had no way to get him to the hospital. His child seat was in her mother’s car which was not on scene. I asked one of the medics that I was with if he was going to call his supervisor to get a car seat, and he said to me, “No, we’re just going to use the Pedi-Mate.” From under the bench seat, his partner pulled out what looked like a rolled up strip of vinyl material, and rolled it out on the head of the stretcher. After a couple of quick buckles, the head of their stretcher had been turned to a pediatric capable stretcher, all from a device that, when not in use, could easily fit in a space as small as a glove compartment. Designed to support patients ranging in size from 10-40 lbs, the Pedi-Mate is the perfect solution for every ambulance on the street, but especially for those that are too small or packed with so much equipment that carrying a full sized car seat could be difficult. In fact, the state of West Virginia thought it was such a great product that in 2011, they acquired a National High Way Safety grant allowing them to buy 1,000 Pedi-mates and to distribute them to ambulances across the state. While a little pricier than some other options, the $200-$250 device is one that will pay for itself quickly. My view of EMS has been admittedly narrow. Although I have been in the business for a little bit, the variety of services that I have worked for has not been as broad as some others. If anyone has any other products that they feel everyone should know about, I invite you to please share them below!